Well I couldn't let this day or weekend go by without saying something. Even with the crazy busy schedule around here lately. It seems the cosmic cogs of creation and working and doing all the mundane tasks a bachelor has to do if they are going to get done have not fallen into place. In other words I just can't seem to get anything done around here! I am sure everyone that has a job they don't like and wish they were doing something else feels. And I am sure we have all been there. So hopefully this day off, for most people, will help get us back into the swing of things. Of course today for me will be filled with those mundane tasks of laundry, cleaning, some cooking, and all the things I tend to neglect as a bachelor, or actual more like a one man band. And let us hope the creative juices come back real soon. So here is to all the fallen, those that have served, those that are willing to serve, and those that will have to serve. Because in this crazy world we need you now more than ever. 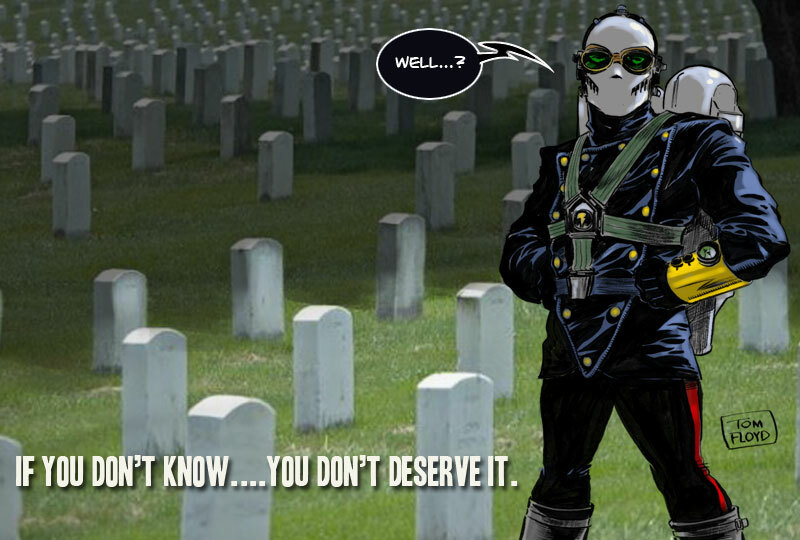 And as always thanks to all you Loyal Legionnaires for understanding. I just couldn't resist posting this. 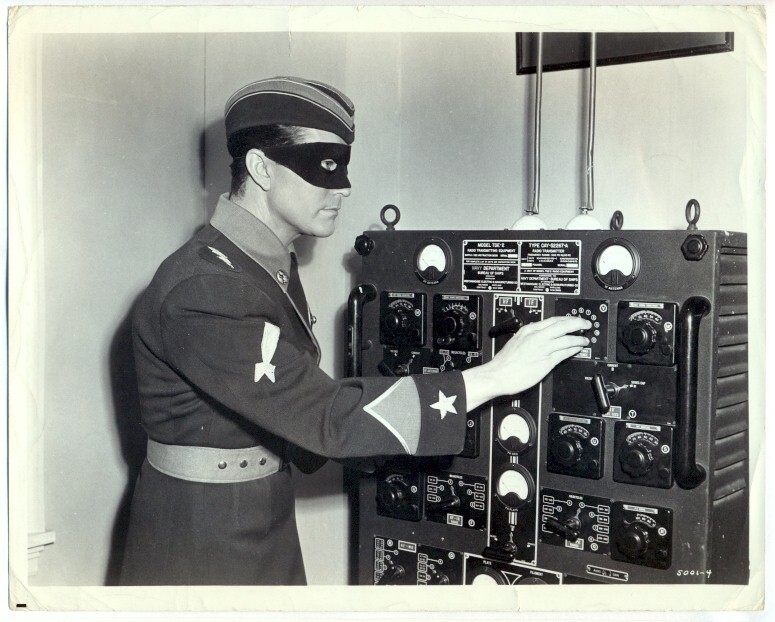 A publicity still from Commando Cody at his radio set. I have never seen this photo before and found it on ebay. I didn't bid on it since the guy wanted 50 bucks for it. I have several lobbycards and photos but again never seen this one and just couldn't pass up letting you see it. Even if I can't afford it. Awesome photo for sure!!! The KiGor widevision book is now grayscaled. So instead of moving forward, which by the way I have had some trouble lately doing. But that is another story for another day. I decided before tackling the yard work for the day that I would grayscale of the images. So here is Helene fighting the mandrills / Beastmen. 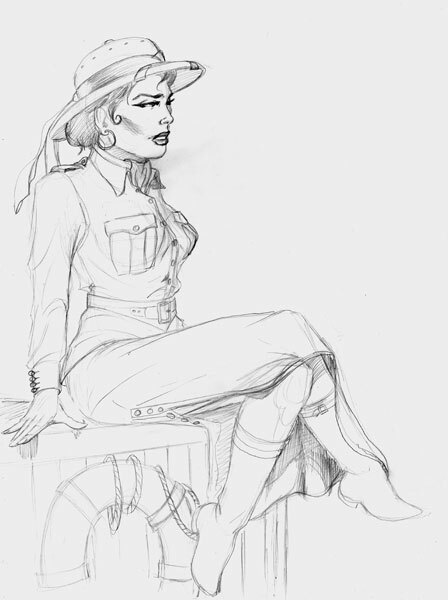 I think this is cropped about what it will look like in the book. I my lighten it up a bit as I think most printers print darker than the image. Now it is around lunchtime and I am off to mow the back part of the property. Which looks a bit like the jungle Helene is in, since all the rain we have had. Well it has been awhile since the last posting. Sorry I will try to do better and keep you informed. The format of the KiGor widevision story has been cut to six illos, so I only have a couple left to do. Which is a double edged sword. Good part is I only have two more illos to knock out, bad part is there will only be six illos. So as per what has been know as the 'floyd luck' I was working on one of the illos that is going to not appear. ha. Always seems to happen that way .... doesn't it. So I thought I would at least show some of the work I had done on it. 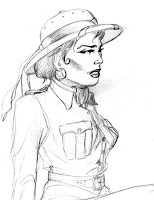 And hey you never know when I will need a pic of Helene dressed in her safari gear. 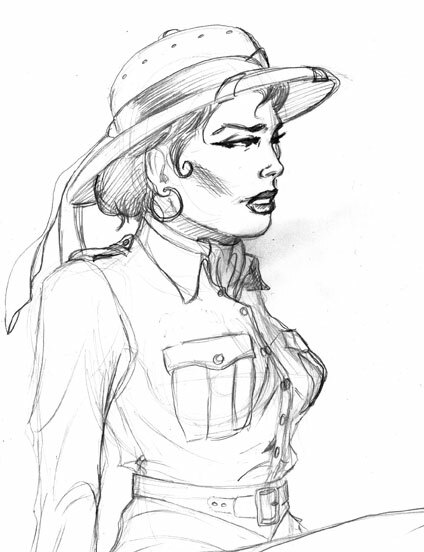 I kind of patterned it after Deborah Kerr's safari gear in King Solomon's Mines. Again with only doing six illos, that means I will be starting on the KiGor comic sooner, and finishing up Chapter 4 pretty quick too. Again for taking so long, but with full days at work and all it is just tough to make extra time for all the extra things going on at this moment. So I do apologize for that. I wasn't really going to post anything, since the web is rocked by the news. But someone, a close friend, convinced me to post. Some people were posting the first things they had seen of Frazetta's work. I honestly don't remember the first thing I saw of his. I think it was the Son of Tarzan Ace book cover above. I think it was around 1964 or maybe earlier when he was doing the Ace covers with Roy Krenkel doing some and Frazetta doing some. I was a big reader of the Burroughs Ace books. I used to save my money all year round to go to one bookstore in Beatrice Nebraska where they carried all the Ace titles. Those books were so great since Burroughs novels were fairly short and the format of the Ace books fit in your back pocket. The original mobile device, for sure. 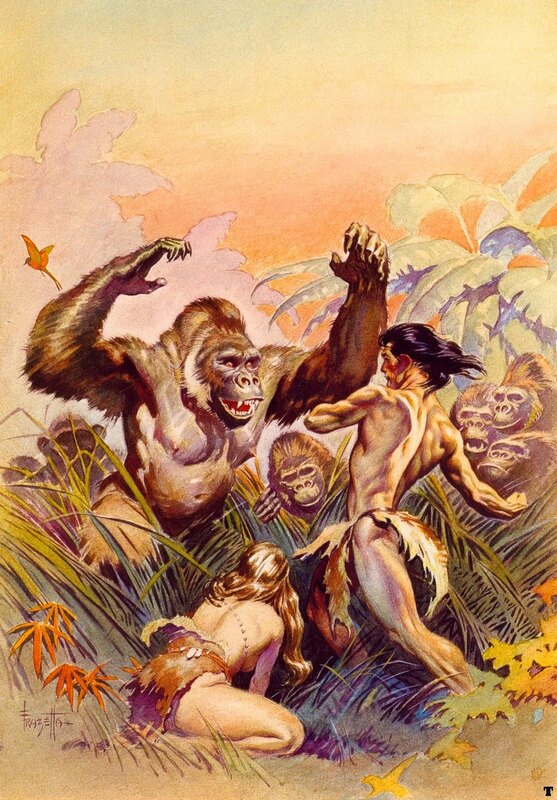 Like most artists today, I grew up looking at those great Frazetta covers and frontispieces. They were more representational of the genre of story than actually being from the stories, but who cared. They got you to buy the books and that was the main thing. At first I admired his paintings, but as I started to try to learn to use a brush then I really paid attention to his black and white work. Frazetta's work inspired a whole world of images of the mind. New worlds to conquer. Moments in time of awe and wonder. I think each person who viewed one of his paintings got something different from it. 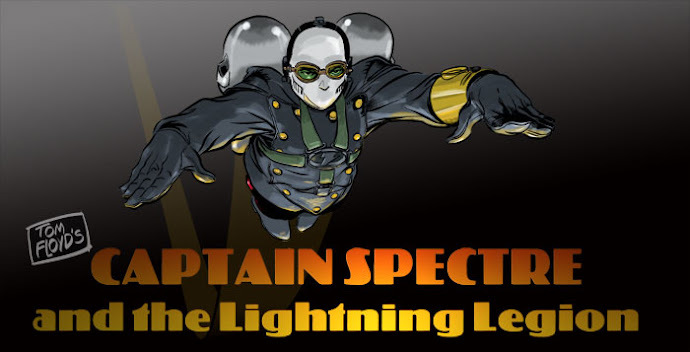 Some focused on the design, some the figures, some the mood, some the action, and some the method. I think these works hit me like a roundhouse punch. The way he pulled the focus of the image in and out to give each area a special place in your imagination. Illustrators like Rockwell and Parrish worked from a lot of reference and it seemed to show in their work. 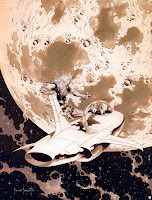 Frazetta's work was like you had a camera from the Twilight Zone and were taking pictures from another world. Thanks Frank, I never met you but I visited your worlds.